In 1941 a beautiful native timber Nurses Home opened in Raetihi to accommodate staff of the Waimarino Hospital. The hospital has since gone but The Old Nurses Home (otherwise known as Snowy Waters Lodge) and The Doctors Residence (see listing p20006299) is now a boutique accommodation and events venue. Set within 5 acres of park-like grounds, our sunny, north-facing, open-plan, rustic kitchen and lounge open out to an extensive outdoor entertainment area with BBQ's, a wood-fired pizza oven and a huge outdoor fireplace. This is a wonderful, tranquil space great for alfresco dining. The views of Mt Ruapehu and Mt Ngauruhoe are breathtaking. There are ten guest bedrooms with either mountain or garden views. Separate male/female bathrooms each have three toilets and three showers plus there’s a drying room for ski gear and mountain bike storage. European style central heating will keep you cosy warm and a log burning fireplace is perfect for toasting marshmallows. Outside, a spa pool is set amongst rocks and palm trees with mountain views. We also have our own onsite playground, bouncy castle (weather permitting), The Snowy Train and a pet goat. 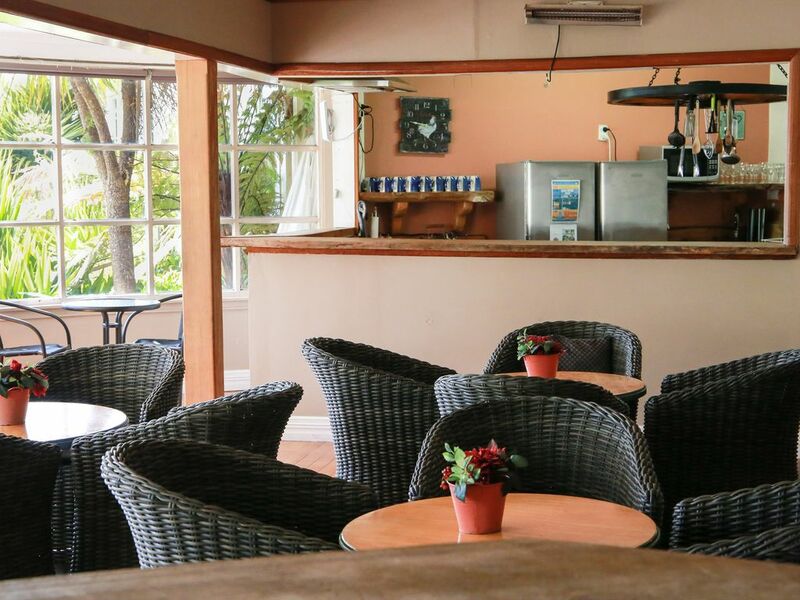 Towering gum trees, enormous oaks and colourful gardens surround your accommodation, making it private and peaceful, yet within a 10-minute walk of Raetihi’s main street cafes. We are 10 minutes from Ohakune, 30 minutes to Turoa Ski Area, 45 to Whakapapa. MEETINGS: Our lounge can be set up for meetings and/or dinner parties, seating up to 50 people theatre style, 20 u-shape and 40 for a formal dinner. Add our outside marquee (additional cost) to seat a further 40 guests. WEDDINGS: Book the Lodge, Doctors Residence and Cabins exclusively and we'll provide a Wedding Coordinator at no extra cost. EVENTS: Murder Mystery parties are our specialty. The package (must be pre-booked) includes Doctors, Nurses and crazy patient costumes, scripts and a facilitator. ACTIVITIES: Your hosts are passionate outdoor enthusiasts and will be happy to assist with booking Bridge to Nowhere tours, the Whanganui River canoe journey, Tongariro Crossing transport or the Mountains to Sea cycle trail. We have plenty of off-street carparking. Special conditions: Minimum two night stay on weekends during peak season (winter). Brilliant! we stayed with 7 families, 13 adults 13 small children and there were still spare rooms/beds (we booked the whole place) was a great property big enough for everyone and so much fun for the kids, love the separate lounge and the kids train was super fun!! thank you!!! The location is very nice and there are lots of things to do for adults and kids.